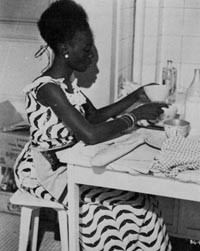 In his pioneering 1966 film, Black Girl, the great Senegalese author and director, Ousmane Sembene, explores the complex dynamics of the immediate post-colonial period through the simple, devastating story of a Senegalese servant, Diouana (Mbissine Thérèse Diop), and her relationship to the unnamed French couple (Anne Marie Jelinek and Robert Fontaine) who employ her. Sembene reverses the Eurocentric convention where the French characters are those who are individualized and the colonized represent their group. The film begins with a ship arriving in a harbor in southern France carrying Diouana who has been invited by the couple to rejoin them. In Dakar, before Senegalese independence, she worked for them as a nanny and expects to do the same work in Antibes. She had heard wonderful stories about the colonial motherland. In the flashbacks that take place in Dakar before her emigration, she is ecstatic about her upcoming trip. She talks of the shops and the new fashionable clothes she will buy. She imagines that her relatives will die of envy when they think of her living in France. She soon finds out that the couple can no longer afford the many servants they had in Africa and she is expected to be an all-purpose maid as well as a nanny. Her life is a dreary routine of cleaning and cooking in their small apartment, and she is driven to desperation. Monsieur and Madame have their own totally separate expectations. They believe Diouana should be grateful for any work they offer her. They do not afford her the opportunity to go out and explore the city and do not pay her regularly. They never comprehend that she has the same needs and desires as they do. When she wears a pretty dress and high heels to do housework because it is a small pleasure, a rare chance for self-expression and probably her only occasion to wear them, Madame screams at her and tells her to wear something more appropriate. When she seems despondent and spiritually broken, the couple’s only response is to ask if she is ill. The main focus of Black Girl is Diouana’s sad odyssey in Antibes and its emotional core is provided by Diop’s intense, gestural performance, which is strengthened further by Sembene’s quietly observant camera. The whole drama is revealed through quotidian details. In so doing, Sembene makes an argument about colonialism through placing Diouana and the couple in parallel positions. He also shows us how the experience of Monsieur and Madame differs in Dakar and at home. In Dakar they are better off, owning a larger apartment and employing more than one servant. In a scene where Madame looks for a nanny, she walks through the streets with confidence, knowing that all of the Senegalese must treat her with respect because they are in need of the employment she can provide. She can choose among them, as she likes. At home, in France, in her small apartment, her life seems much less satisfying. She is constantly annoyed at her husband and is purposeless and bored. She and her husband talk of going back to Dakar where there is greater opportunity. When their friends visit, Madame asks Diouana to prepare Senegalese food. Diouana remembers that they never ate this food when they lived in Africa. In France, however, it is their African experiences – represented by the food and Diouana – that make them interesting to their guests. This past experience provides the allure of the exotic to their otherwise mundane existence. The truth is that the situation in Senegal has changed since independence, and the French couple can never regain their privileged positions in the post-colonial world. It is worth noting also, that although Diouana and her nation have gained independence, she still believes that it is necessary for her to look to France for employment and a future. The boyfriend (Momar Nar Sene) Diouana left behind believes in independence and mocks her Francophilia. The argument between these two characters poses the larger question of whether or not political freedom is viable without financial independence. A mask serves as a central symbol in the film. It represents the connection between Diouana and her employers, as well as their inevitable lack of connection. The mask first appears on the face of a young boy (Ibrahima Boy) in Dakar. Diouana takes the mask from him to present as a gift on her first day of work. Madame is very pleased to get it. She shows it to Monsieur, who carefully places it in the apartment alongside the other pieces of African art. They are thrilled that the mask is ‘genuine,’ presented by a ‘real’ African. In the apartment in Antibes, the mask hangs alone on a white wall, forlorn, separated from its companions in the African house. Like Diouana, it is isolated and out of context. As a final act of defiance, Diouana takes back the mask. She fights with Madame over it; they both hold onto it and spin around, tugging at it. The camera is placed above the mask so that we see the two women spinning around with grotesque expressions of anger. In the process, they wear masks of their colonial roles as the cruel oppressor and the outraged oppressed. In a sense, both of them need the mask: for Diouana it is a piece of home that she gave away as an appreciative equal, happy to work but expecting respect and pay; for Madame, the mask symbolizes her formerly exalted status in Africa, when she was the benevolent and powerful white mistress. When Monsieur returns the mask to the Senegalese boy who was its original owner, it underlines the separation between the colonizer and the formerly colonized. Monsieur wears sunglasses to hide his face and his fear as he walks through the streets of Dakar; he dons a mask of rather unconvincing Western confidence. The boy chases him through the street wearing the mask, turning it into a threatening symbol of a free Africa. The last shot of the film is of the boy’s distraught, weeping face, revealed after having removed the mask. His humanity is obvious to us but seems lost on Monsieur, who runs away from the boy and the country over which he has no control and in which he has no place. Taking on different meanings throughout its journey, the mask and the film travel from Africa to the colonial metropole before returning home once again. Rahul Hamid teaches film at New York University's Gallatin School of Individualized Study and is an editor at Cineaste Magazine.